The Striped Mockery of God. This world has become so wicked, that whenever it thinks of the rainbow, it thinks of so called “equal rights” for sodomites to get married. In response to that, let me post a beautiful picture. Now let’s talk about what the rainbow really is. In Genesis Chapter 6, we read how the world had become so evil, that God was repentant that He ever made mankind, and decided to send a global flood. And God saw that the wickedness of man was great in the earth, and that every imagination of the thoughts of his heart was only evil continually. And it repented the Lord that he had made man on the earth, and it grieved him at his heart. And the Lord said, I will destroy man whom I have created from the face of the earth; both man, and beast, and the creeping thing, and the fowls of the air; for it repenteth me that I have made them. But Noah found grace in the eyes of the Lord . Noah had found grace in God’s eyes, so he and his family were found worthy to go on the ark to avoid the flood. After the waters had receded, Noah built an alter unto The Lord and He made a covenant with mankind. And Noah builded an altar unto the Lord ; and took of every clean beast, and of every clean fowl, and offered burnt offerings on the altar. And the Lord smelled a sweet savour; and the Lord said in his heart, I will not again curse the ground any more for man’s sake; for the imagination of man’s heart is evil from his youth; neither will I again smite any more every thing living, as I have done. While the earth remaineth, seedtime and harvest, and cold and heat, and summer and winter, and day and night shall not cease. God also made a symbol of His covenant. And God said, This is the token of the covenant which I make between me and you and every living creature that is with you, for perpetual generations:  I do set my bow in the cloud, and it shall be for a token of a covenant between me and the earth. And it shall come to pass, when I bring a cloud over the earth, that the bow shall be seen in the cloud:  And I will remember my covenant, which is between me and you and every living creature of all flesh; and the waters shall no more become a flood to destroy all flesh. And the bow shall be in the cloud; and I will look upon it, that I may remember the everlasting covenant between God and every living creature of all flesh that is upon the earth. And God said unto Noah, This is the token of the covenant, which I have established between me and all flesh that is upon the earth. The rainbow is a token of God’s covenant that He will never again flood the earth. Now let us take a look at how this relates to the evil sodomite flag. Notice how the text says God will never flood the earth again no matter how wicked it becomes. That being said, we read in the Bible that Satan will take what belongs to God and use it against Him. Here is an example. And he (Satan) brought him to Jerusalem, and set him on a pinnacle of the temple, and said unto him, If thou be the Son of God, cast thyself down from hence:  For it is written, He shall give his angels charge over thee, to keep thee:  And in their hands they shall bear thee up, lest at any time thou dash thy foot against a stone. Satan used scripture to mock The Lord Jesus. Through scriptural study, The Holy Ghost has led me to believe that this is what Satan is doing with the rainbow. 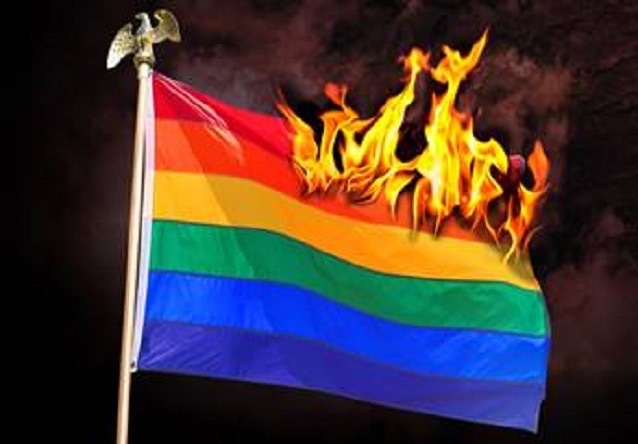 Whenever the sodomites have their parades and fly their filthy flags, them, and their father the devil (John 8:44) are reminding God that no matter how much they practice their wicked lifestyle, He will never send a global flood to kill them again. Now that you know why Satan inspired the sodomites to use the rainbow, and you love The Lord, then you should want to burn every single one of those damned rainbow flags. In the name of The Lord Jesus Christ I write unto you. Amen.